In another month where just about every type of consumer complaint was down, FCRA broke out with an almost 60% increase over the prior month. Why? Who knows. 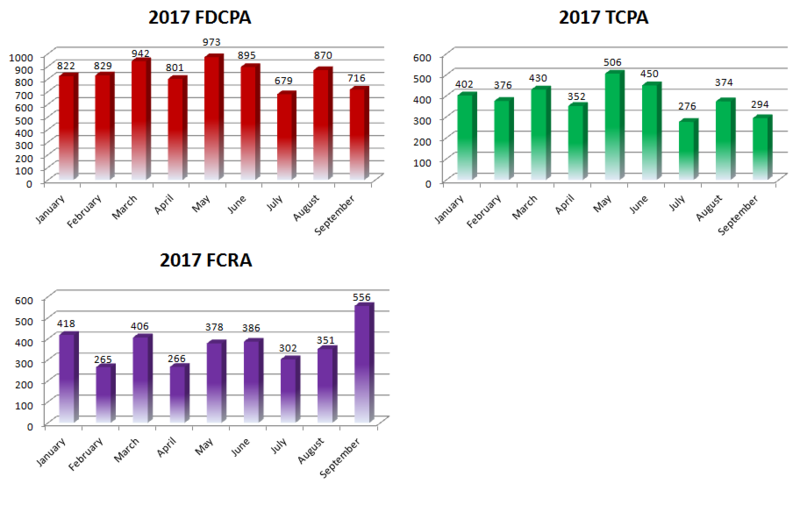 But FCRA alone is on a bit of a tear this year, up 13.5% YTD while FDCPA and TCPA(!) are both down over 6% YTD. FCRA’s increase keeps it in line with the aggressive growth in recent years. However, for those of you who have been watching this data for a while, it should be somewhat surprising to hear TCPA remains down. Without a significant change in plaintiff filing behavior, we are actually on track to see TCPA filings drop from the previous year for the first time since, well, since the start of TCPA litigation. Here is a month-by-month look at litigation so far in 2017. In CFPB news, while it is still historically high, CFPB complaints had their slowest month of the year with *only* 3239 complaints filed. CFPB complaints are still more than 20% YTD and are certainly going to set a new record when the year is up. And in BBB news, we spoke too soon last month. Once the numbers shook out, August BBB complaints against debt collectors weren’t only *not* way down from the previous month, but they had actually set a record for the most complaints ever logged in a month (1859) which topped the previous record set the month before (July, with 1798). (oops…). In September, the total was almost certain to lose momentum, and it did, dropping to 1466 complaints. Here is a month-by-month look at CFPB & BBB complaints so far in 2017. Putative class actions took an interesting twist last month with 23.7% of FDCPA, 18% of TCPA and an insane 44.1% of FCRA lawsuits filed that way. About 31% of all plaintiffs who filed suit last month had filed at least once before, an historically low number (it is usually 33-36%). And finally, Chicago attorney Celetha Chatman takes the crown for the first time as the most active consumer attorney this month by representing of 31 consumers in September. New York attorney Craig B. Sanders retains it for representing the most consumers year-to-date (411). 1466 consumers filed BBB complaints, 3239 consumers filed CFPB complaints, and about 1407 consumers filed lawsuits under consumer statutes from Sep 01, 2017 to Sep 30, 2017. Of those cases, there were about 1407 unique plaintiffs (including multiple plaintiffs in one suit). Of those plaintiffs, about 435, or (31%), had sued under consumer statutes before. There were a total of 1466 BBB complaints against debt collectors and creditors from Sep 01, 2017 to Sep 30, 2017. That is down -21.1% from last month. There were 3239 complaints filed against debt collectors from Sep 01, 2017 to Sep 30, 2017. This includes 3113 (96%) timely responses to complaints, and 126 (4%) untimely responses.